Reinvent yourself and add a casual flavor to your daily walk in the ‘Waldo’- blue. 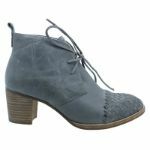 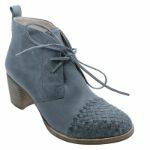 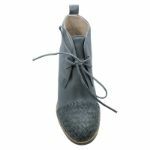 Everything about the shoe will excite you – the chic crisscross design in the front, the rustic bohemian appeal of the wrinkled leather upper, the ample leather laces, the comfortable moderate heel, the soft leather linings and the meticulously handmade outsole. Put them on to make heads turn.